The first week of free agency was action-packed, as is usual during an offseason when the likes of LeBron James, Paul George, Kevin Durant, Chris Paul and DeMarcus Cousins are unrestricted free agents. The King eventually chose to move to the Lakers for the next chapter in his life, while the likes of PG-13, CP3 and the Slim Reaper stayed on with the Thunder, the Rockets and the Warriors respectively on max deals. However, KD's ability to take a $5 million haircut on his wages annually allowed the Warriors to sign Cousins to the taxpayers' mid-level exception of $5.3 million following other teams' aversion to handling the injured superstar a max contract of his desired length. 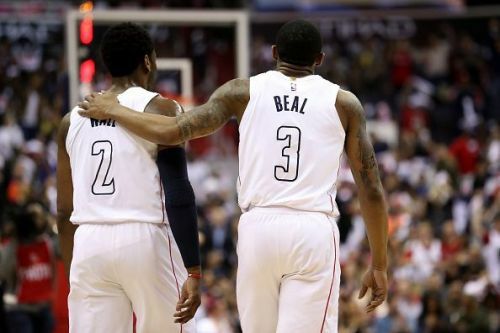 The Wizards have been stuck between a rock and a hard place for a while now. For the past 2 seasons, they've had a pretty good team with a fully unleashed Big 3 of John Wall, Bradley Beal and Otto Porter. But a bad bench lineup and the inability of Marcin Gortat to provide adequate rim protection has put them a tier below the Cleveland Cavaliers as the class of the east. Now that LeBron is gone, the Wizards have had the opportunity to draw level with the likes of the Sixers, Celtics and Raptors. They've already pulled off a couple of pretty good moves. Following Dwight Howard's buyout agreement with the Nets, who he was traded to last month from Charlotte, the Wizards were the first to obtain his signature for the taxpayer's midlevel exception of $5.3 million. They also traded Gortat away to the Clippers in exchange for depth at the guard position in Austin Rivers, who is, by now, an adequate NBA player. Their bench now sports a renewed look with the signing of Jeff Green on a veteran's minimum deal. Green will replace Mike Scott, an able 3-point shooter at the power forward position but who didn't have the former's ability to do everything on the basketball court and falls short at the defensive end.